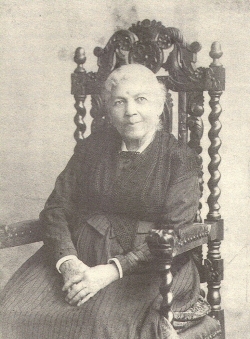 Born into slavery in Edenton, North Carolina, Harriet Ann Jacobs was the daughter of slaves, Delilah and Daniel Jacobs. Harriet Jacobs is best known for her autobiography, Incidents in the Life of a Slave Girl, edited by white abolitionist Lydia Maria Child, and published in 1852. Using the pseudonym “Linda Brent,” Jacobs tells the story of her life as a slave of a “Dr. Flint,” to whom she was willed as a young girl after her mistress died. At this point in her young life, Harriet encountered unceasing sexual advances from Flint. She escaped Flint’s household in 1835, but remained nearby, living in an attic for several years in order to stay near her son. She made her final escape in 1842 and was able to reunite with her children. She settled in Rochester, New York, where she joined the network of abolitionists. At the urging of white abolitionist Amy Post, Jacobs wrote her autobiography. Still pursued by slave catchers, Jacobs fled to Massachusetts. During the Civil War, Jacobs and her daughter, Louisa, worked with the New England Freedman’s Aid society, which supported her effort to travel to Virginia to provide emergency health care and establish a school for black children. While living in Boston, Jacobs joined the New England women’s club movement and supported herself by running a boarding house for Harvard students and faculty. She and Louisa later moved to Washington, D.C., where she died in 1897. She was buried in Mount Auburn Cemetery in Cambridge. Jean Fagan Yellin, “Harriet Ann Jacobs,” in Darlene Clark Hine, ed., Black Women in America: An Historical Encyclopedia, Vol. I (New York: Carlson, 1993), 627-29; Harriet Brent Jacobs, Incidents in the Life of a Slave Girl (1861); and Dorothy Sterling, ed., We Are Your Sisters: Black Women in the Nineteenth Century (New York: W.W. Norton, 1984). Nineteenth Century (New York: W.W. Norton, 1984).